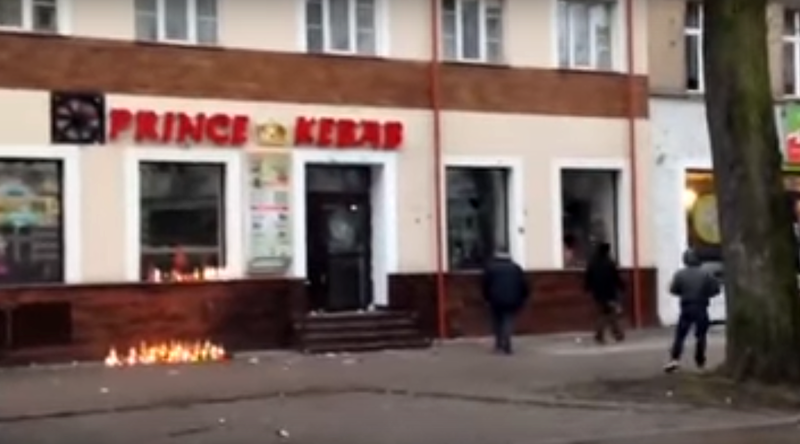 At least 25 people were detained in the Polish town of Elk on Sunday after they smashed up a kebab diner and clashed with police, throwing firecrackers and stones. Up to 300 people took part in a rally after a Pole was allegedly killed by men of Arab descent. City authorities in Elk, a city of 60,000 in northeast Poland, have requested extra police forces to be dispatched to secure public order after mass disturbances rocked its streets on Sunday. A few hundred locals gathered in front of the Prince Kebab diner to light up candles in a vigil for a 21-year-old Daniel, a local resident, who is said to have been stabbed to death in a brawl involving foreign employees of the café on Saturday night. — Mariusz Filipowicz (@FilipowiczMar) 1 января 2017 г. Under an investigation launched by police, four people were arrested. Although police have not officially revealed the nationality of the suspects, Polish media reported they were two Algerians, a Tunisian and a Moroccan. All the suspects are said to be have been working at the vandalized diner, which is owned by a local entrepreneur. — Prawa strona 🇵🇱 (@BekazLewactwa) 1 января 2017 г. Shortly after the gathering turned violent, some people started to hurl stones and firecrackers at the building, smash its windows, broke into the premises and destroyed the cafe’s property. As the police tried to calm down the protesters, they turned on officers, showering police cars with firecrackers, bottles and stones. “In the crowd, numbering between 200 and 300 people, dozens were behaving aggressively,” police spokesman Rafal Jackowski said, as cited by TVP.info. Upon wreaking havoc on the diner, the mob reportedly vandalized another restaurant, said to be run by the same people, Elk Councilor Michael Tyszkiewicz told PAP. Twenty-five participants of the rally were detained by police, and may face charges for inflicting damage to property and disrupting public order, Jackowski said. Polish media report that the brawl between the 21-year-old victim and the suspects in his murder started after he threw a firecracker inside the diner at about 11pm local time on Saturday, provoking the suspects to come out. The ensuing fight resulted in him receiving two wounds, reportedly from a knife. The exact cause of death is yet to be determined. An autopsy is scheduled for Monday. Meanwhile, Elk Mayor Tomasz Andrukiewicz called on citizens to not incite hatred and to respect the grief of the deceased Polish man’s family. “There has been a great tragedy. I would like to appeal and ask residents for calm and to respect the tragedy the family of the 21-year-old Daniel is experiencing. I offered psychological help to this family,” he said, as cited by Gazeta Wiadomosci. — Polska The Times (@polskathetimes) 1 января 2017 г. “A week ago, someone came to us and insulted us, using profanity. Threatened us and pissed on the wall of the premises. Now it has gone much worse. Two men aged 18-19 and 24-25 years came on the New Year’s Eve and demolished our premises. Both had hoods on their heads. Fortunately, all of the events was recorded on surveillance, the matter is reported to the police,” the owner of the diner, Shullye Parvez, told Polska Times. Police have opened an investigation into the incident. If charged with inciting hatred, the perpetrators face up to two years behind bars. Riots in a Polish town compounded by a recent “high-profile” funeral attended by Poland’s president for a Polish truck driver who was killed in Berlin just hours before the Christmas market truck rampage, “provide a wider framework for anti-immigrant and anti-Muslim mood in Poland,” political author and commentator Srdja Trifkovic told RT. “In general, it is the former Soviet bloc countries which also include the Czech Republic, Slovakia and Hungary which have offered stiff resistance to the attempt by the European Union to impose migrant quotas on individual member countries regardless of their parliaments’ will or public opinion. So, it is really in this context that this should be seen as an expression of nativist anger and resistance to what is seen in central and eastern Europe as western Europe’s failed policy of excessive welcoming of the migrants and unsuccessful attempt to [integrate] them into the whole society,” Trifkovic said.